I’ve been stalking the Instagram of Makeup Revolution for a really long time but I didn’t make any purchase until the Black Friday sale because shipping was GBP7.95 and I already had more than enough makeup to last me a few lifetimes. But of course, all sense of reasoning disappears when the huge sale came! They had a few gift sets that were discounted, with a huge Black Friday gift set with purchase over GBP30. I spent a total of about GBP40 inclusive of international shipping, and I’m honestly extremely happy with what I’ve got – definitely with the quantity, but also with the quality of some of the products that I’ve already tried. Let’s see what I’ve got! This set had 2 brushes – F104 & F105, a blusher palette and a highlighter palette. The original price is GBP14 so the discount was fantastic! I thought the set was perfect to try their highlighter and blusher palettes and also their brushes. This set includes the Radiant Illuminator Pressed Powder, Large Duo Bronzer and Blusher, as well as the Powder Brush F104, Contour Brush F105 and Stipple/Blending Brush F103. 5 items for under GBP7? Yes, please! 2 of the brushes are repeats of the above set, but I always need more powder and contour brushes anyway. A few items that I bought, which weren’t on sale. I’ve been trying out the whole contouring thing lately – I just bought the Anastasia cream contour kit and wanted to compare that with something way cheaper. I’ve also heard a lot of praise for Makeup Revolution’s Iconic Pro lipstick line, so I picked up a matte and non-matte in similar colours to test. The Matte blush was an impulse purchase; I just love blushes! 5. Mono Eyeshadow in Killer! 8. Ultra Velour Lip Cream in Can’t We Just Make Love Instead? Isn’t it just insane? I thought the gift was so ridiculously generous – they are not discontinued products, not in some funky shades that noone else will wear, and are all full size! 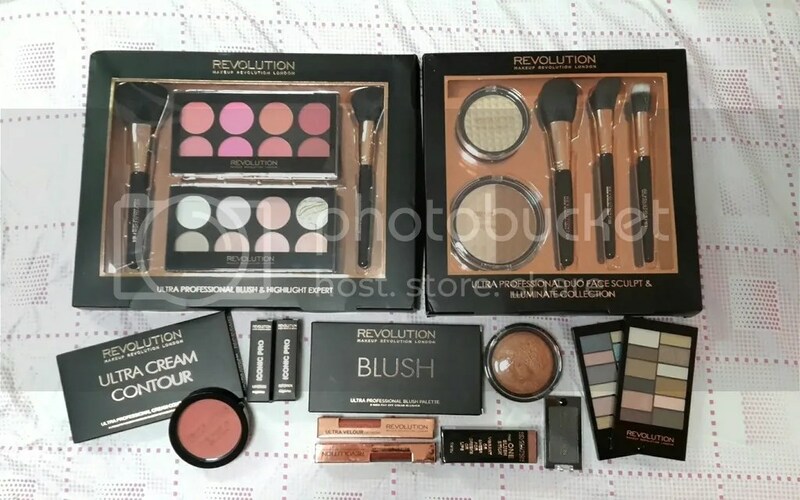 Have you tried Makeup Revolution products? Did you also take advantage of their sale and Free Gift during the Black Friday sale?